PLE‑1ME120‑EU Plena Mixer Amplifier4 microphone / line inputs, plus music source inpu..
BOSCH PLE‑1ME240‑EU Plena Mixer Amplifier4 microphone / line inputs, plus music source inp..
BOSCH PLE‑1ME060‑EU Plena Mixer Amplifier4 microphone / line inputs, plus music source inp..
BOSCH LBC 2900/15 Unidirectional Handheld MicrophoneWith this unidirectional microphone, Bosch ..
BOSCH PLE‑1MA030‑EU Plena Mixer Amplifier100 V and telephone input with priority & VOX2-ton..
BOSCH PLE-1MA060-EU Priority mixer amplifier, 60W100 V and telephone input with priority & ..
BOSCH PLE-1CS Call station, all-callPTT-key for calls for activationMomentary or toggleGreen LED, in..
BOSCH PLE-2MA240-EU Priority mixer amplifier, 2-zone, 240WCommercial Type No. : PLE-2MA240-EU Pr..
BOSCH PLE-2CS Call station, 2-zoneCommercial Type No. : PLE-2CS Product No. 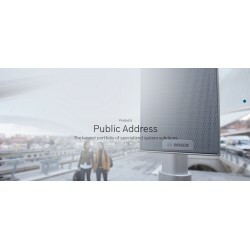 : F.01U.066.941Modern..
BOSCH LBB1925/10 System preamplifier, 6-zoneSix-zone system pre-amplifier, with single or dual chann..
BOSCH LBB1941/00 Call station, all-callStylish all-call call station, intended for LBB 1925/10 ..